Unite your diverse Hispanic community in song and enrich worship with this Spanish-language hymnal that carries the music of God's word straight to the hearts of your assembly! This hardcover hymnal contains words and music for more than 740 songs including over 100 bilingual and 200 new titles as well as the best music from the previous two editions. It features thirteen total Mass settings (and Revised Mass settings for Misa del Pueblo Inmigrante and Nueva Misa Latinoamericana), thirteen indexes, suggested psalms for the three-year liturgical cycle, a glossary of musical terms and symbols as well as a glossary of musical terms, symbols and styles. This softcover, words-only hymnal contains words and music for more than 740 songs including over 100 bilingual and 200 new titles as well as the best music from the previous two editions. It features thirteen total Mass settings (and Revised Mass settings for Misa del Pueblo Inmigrante and Nueva Misa Latinoamericana), thirteen indexes, suggested psalms for the three-year liturgical cycle, a glossary of musical terms, symbols and styles. These three spiral-bound volumes feature keyboard accompaniments for the music of Flor y Canto, tercera edición, including all enhancements featured in Flory y Canto, segunda edición as well as thirteen indexes and chord symbols above each melody line. These two spiral-bound volumes contains guitar arrangements for the music of Flor y Canto, tercera edición. Its features include a glossary of chord charts, chord symbols above the melody lines, thirteen indexes, and songs featuring vocal harmonies. This 24-CD set features music from Flor y Canto, tercera edición and new recordings from Flor y Canto, segunda edición. This spiral-bound, Psalter edition includes words and music designed for cantors and soloists. It features melody lines for every verse in a single setting as well as psalms and canticles for the liturgical year. This spiral-bound, guitar accompaniment book features words and chords designed for cantors and provides music for soloists, including melody lines for every verse in a single setting as well as psalms and canticles for the liturgical year. This guitar accompaniment eBook includes words and chords designed for cantors and soloists. It features melody lines for every verse in a single setting as well as psalms and canticles for the liturgical year. This eBook is not intended for desktop/laptop or for printing/copying; slightly modified from original print version. Please note: the USCCB does not currently approve tablet devices for liturgical use (at ambo/pulpit). This eBook contains guitar arrangements for the music of Flor y Canto, tercera edición. Its features include an interactive table of contents and mobile eBook tips as well as a glossary of chord charts and symbols above the melody lines, thirteen indexes, and songs featuring vocal harmonies. This eBook features keyboard accompaniments for the music of Flor y Canto, tercera edición, including mobile eBook tips, an interactive table of contents as well as thirteen indexes and chord symbols above each melody line. The Hispanic community is currently the fastest-growing segment of the U.S. Catholic Church, and Flor y Canto has grown right along with it! Now, in its third edition, Flor y Canto offers a balanced collection of over 740 songs—the best from the previous two editions, plus 200 new titles that speak to the whole family and support living faith, both within and beyond the liturgy. 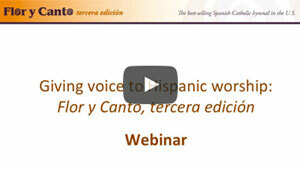 Learn how one community in Ohio united their multicultural parish with Flor y Canto, Tercera Edición. 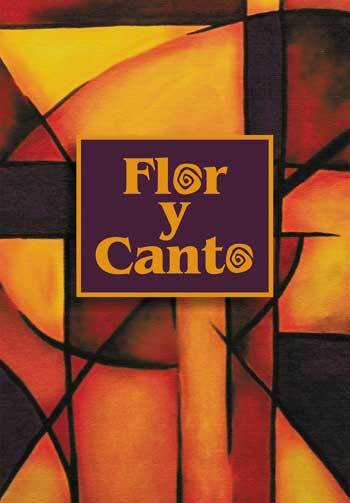 Retaining the poetry of their original Spanish, the songs in Flor y Canto, Tercera Edición are rich in tradition. Celebrate the diverse cultures within the U.S. Spanish-speaking community with music from the Caribbean, Central and South America, Spain, Mexico and more! Misa de la Aurora by Juan J. Sosa, Pbro. Misa a Nuestra Señora de la Altagracia by Carlos Manuel Santana Reyes, Pbro. Worship with confidence knowing all service music was guided by Church documents and expanded to include more Latin selections for the liturgy including Misa Gregoriana (Chant Mass). A variety of accompaniment books—all available as physical books or convenient and easy-to-use eBooks—ensures that your musicians will have the tools they need to bring the songs you know and love to life. Featuring beautiful recordings from professional musicians, the comprehensive CD library maximizes valuable rehearsal time by helping cantors, choirs, music directors and instrumentalists to develop an ear for the songs before ever singing or playing a note. Whatever your needs, and however you use it, Flor y Canto, Tercera Edicion is sure to infuse your services with the Latin-sound your bilingual assembly loves. Not sure this is the hymnal you're looking for? Explore all of OCP's hymnals.